Engadget published a gallery with photos of the upcoming ASUS N82 (14") and N61 (16") notebooks, which feature one USB 3.0 port. 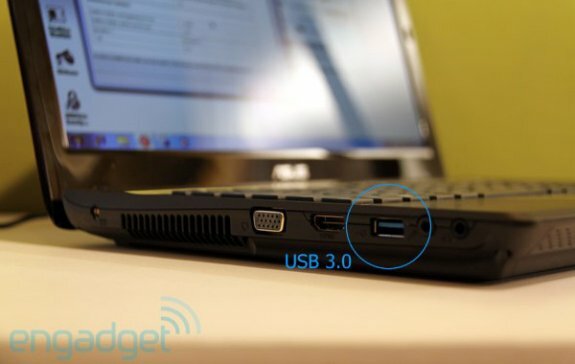 These systems don't have the full speed of USB 3.0 though, live demonstrations showed the USB 3.0 port on the laptops is only about three times faster than USB 2.0. You can check it out over here. Core i5 and i7 CPUs will populate the role of orchestrator inside, while ATI and NVIDIA discrete graphics options will also be made available when these make their imminent Taiwan debut. In live demonstrations, the one USB 3.0 port (yes, you only get one) was shown to be three times as fast as USB 2.0, so not quite reaching its theoretical superiority, but hardly an unwelcome improvement.